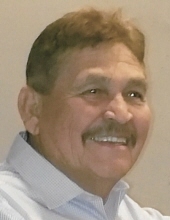 Mr. Miguel Alonzo, longtime Hereford resident, passed away Thursday, June 7 at the age of 65. Miguel Alonzo was born on September 5, 1952 to Jose and Amelia (Suarez) Alonzo in Edinburg, Texas. He married the “Love of his love”, Angie (Mendiaz) Alonzo and together had two sons and a daughter. Mike had a story to tell and his hard-working hands said it all. His hands were tender enough to hold his wife, embrace his children, and work hard to provide for his family. He accepted the challenges of life knowing that with God’s help he would conquer those challenges. For 28 years, Mike took great joy and pride working for Amistad Housing Development. He had a knack for carpentry and renovation. He was known for carrying a pen and paper to write down his thoughts and plans he had for the future for his family. He enjoyed spending time with his grandkids and looked forward to going to see their games. He organized a softball team, “Evolution”, to give him more time to spend with his two sons. He devoted ten years of his life to this team and enjoyed every minute of it. His wisdom and valuable life lessons were shared with us as we sat together drinking his legendary coffee. It was something we all looked forward to every weekend. He was the strong Rock to his family. He taught his children the importance of family, to always plan ahead; he had a strong shoulder to cry on and encouraged us to never allow anything to keep us down but to learn from life’s lessons. These will forever be in our hearts. He will be forever remembered by his beloved wife, Angie Alonzo, their children: Gabriel Alonzo, Michelle and Elov Valdez and Isaac and Cuca Alonzo. Grandchildren: Keena, Kayden, and Kaylee Alonzo, Charisma Alonzo, Elov lV, and Brianna Valdez, Alexandria Valdez, Kaida, Taylor, O’shyn, and Bailey Alonzo. Great Grandchildren: Elov James Valdez V. Mother-in-law: Amalia Mendiaz. Sisters-in-law and spouses: Amanda Hernandez, Marta and Ralph Benavides, and Toni and Carlos Ortega. Brothers-in-law: Alex Mendiaz and Ricky Mendiaz, and many cousins, nieces, and nephews. He will be met at the gates of Heaven by his mother, Amalia Contreras, step-father (mentor), Juan Contreras, sister, San Juanita Alonzo, beloved father-in-law Pablo Mendiaz, brother-in-law Jose Mendiaz and brother-in-law Chon Hernandez. Rosary to be recited at 6:30 pm. "Email Address" would like to share the life celebration of Miguel Alonzo. Click on the "link" to go to share a favorite memory or leave a condolence message for the family.